Stop your search! This is the band that does it all! Want romantic Latin guitars for a wedding, birthday or corporate event? Do you want people to enjoy upbeat music, or even dance? Want to hear English and Spanish favorites that everyone enjoys? 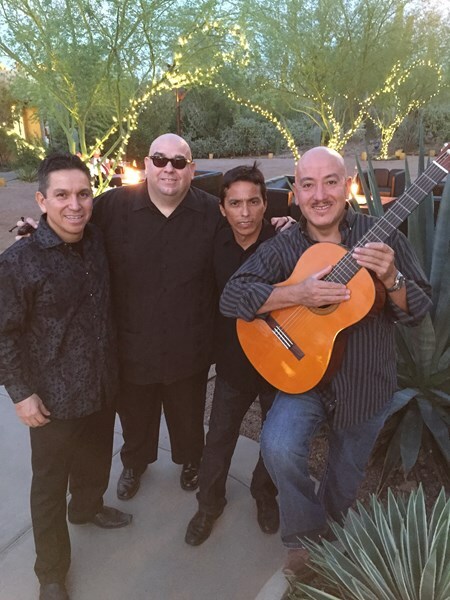 Our group "Latin Guitars" has been doing all the above for over 10 years! We have a broad repertoire and can do elegant, mellow music for a wine tasting, as easily as we can get folks up on their feet dancing at a nightclub. With our 5 man band, we have played the Ritz Carlton, to Tempe Marketplace, and everything in between. 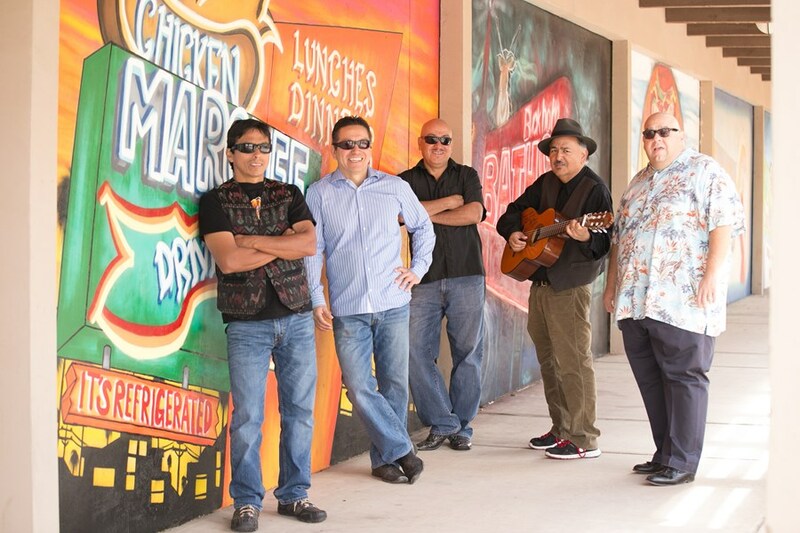 People who hire us in general want a group that has a Southwestern or Latin feel, but can also play American favorites as well. We perform the Gypsy Kings and Santana, just as easily as the Eagles and Jason Mraz. Folks often comment how they have never heard a group play "Sweet home Alabama" right after playing "Bailando" from Enrique Iglesias. The bottom line, is we fine tune our music to the setting we are in. We are much more diverse than any mariachi, jazz or cover band. We also know cost is a factor, so we keep our fees reasonable. We enjoy performing, and want our positive energy to reflect during your event. If you are looking for an upbeat, experienced, fun group that will bring a touch of class and excitement to your event, give us a call! "exceeded our expectations…guests raved about the performance…"
"Their positive energy was contagious…the Spanish guitars were exquisite…set the mood just perfectly…"
"delighted our near capacity crowd…the diversity of their music was captivating…"
"went above and beyond to make our event a success...kept our guests up on their feet dancing until the very end..."
"professional and a pleasure to work with...recommend them profusely…"
L.G. hit home in courtesy, experience, music variation, and really brought my family together for my brothers 30th Bday! They made each of us feel special and my family couldn't stop talking about how great they were! If you have any Hispanic or latin heritage you will love them, they take you on a journey throughout latin America while finding your favorites along the way. If you have no Hispanic descent do not be scared away, book them fast! Their sound of live guitars and numerous variation of instruments will draw you in along with knowing all the American classics old and new! They even incorporated Reaggae to cater to my brothers flavor by playing Bob Marley. Felicia, we really appreciate the kind comments. Honestly, we loved performing for your family and it was great to see your guests enjoying the music, and even dancing and singing along. We are so happy they enjoyed the variety of music we played. Thank you for allowing us to be a part of this special evening! These guys were absolutely outstanding! I seriously do not have enough wonderful things to say about them! We had them play for my husband's 50th birthday party. They are talented, friendly, and great entertainers! You will not be disappointed! Appreciate your kind comments Julie. We truly enjoyed playing for your husband's big day. It was a pleasure to perform in such a beautiful setting with such nice folks. Thanks again! 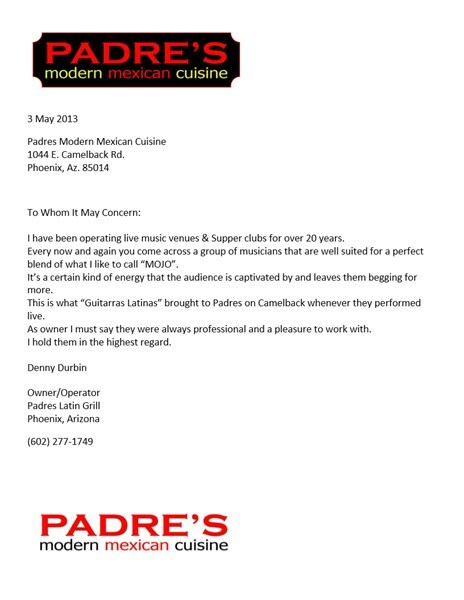 Please note Guitarras Latinas- Latin Band will also travel to Scottsdale, Gilbert, Carefree, Apache Junction, Higley, Fountain Hill, Fort Mcdowell, Chandler, Tempe, Paradise Valley, Queen Creek, Phoenix, Rio Verde, Sun Lakes, Chandler Heights, Glendale, Peoria, Sacaton, Sun City, Laveen, Tortilla Flat, Cave Creek, Cashion, Bapchule, Tolleson, Sun City West, Youngtown, Avondale, El Mirage, Coolidge.